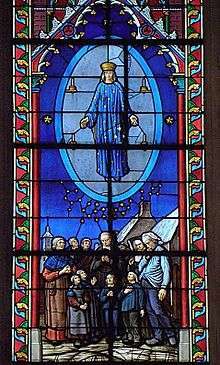 Our Lady of Pontmain, also known as Our Lady of Hope is the title given to the Virgin Mary on her apparition at Pontmain, France on January 17, 1871. 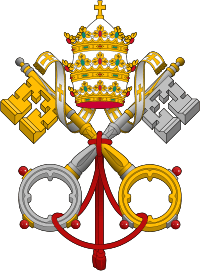 These apparitions were approved by Pope Pius IX. The apparition is said to have occurred at the height of the Franco-Prussian War. Pontmain, a hamlet of about 500 inhabitants, lay between the oncoming Prussian army and the city of Laval. The Barbadette family consisted of father César, his wife, Victoire, with their two sons Joseph and Eugène, aged ten and twelve, and another older boy who was away in the army. On the evening of 17 January 1871, the two boys were helping their father in the barn when the elder, Eugène, walked over towards the door to look out. As he gazed at the star studded sky he suddenly he saw an apparition of a beautiful woman smiling at him; she was wearing a blue gown covered with golden stars, and a black veil under a golden crown. A crowd gathered to pray as word quickly spread among the anxious villagers. Children saw the beautiful Lady, and gleefully pointed up to her. 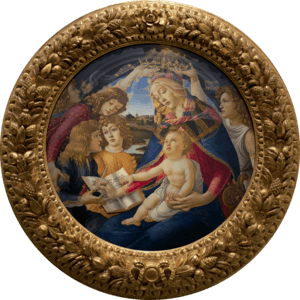 Adults, however, only saw three stars forming a triangle As they prayed the Rosary, the children saw the garment's stars multiply until it was almost entirely gold. Next, the children saw a banner unfurl beneath the Lady. Slowly, a message appeared: But pray, my children. God will hear you in time. My Son allows Himself to be touched." Upon hearing the message read aloud, the crowd spontaneously began the hymn "Mother of Hope". As they sang, Our Lady laughed and joined in the singing. The children squealed with delight as her hands kept time with the music. When the crowd began "My Sweet Jesus," her expression changed to profound sadness and a red crucifix appeared in her hands, with the words "Jesus Christ" above it. Her eyes mournfully contemplated the cross during the hymn. As the people sang the "Ave Maris Stella," the cross vanished and her smile returned, though with a touch of melancholy. Two small white crosses then appeared on her shoulders before Our Lady disappeared behind a cloud. As the night prayers came to a close, the apparition ended. It was about nine o'clock. The Apparition ended after lasting about three hours. That same evening the Prussian forces inexplicably abandoned their advance. General Von Schmidt of the Prussian Army who was about to move on the city of Laval towards Pont-Main, received orders from his Commander not to take the city. On the evening of the ever-memorable 17 January 1871, the Commander of the Prussian forces, having taken up his quarters at the archiepiscopal palace of Le Mans, told Msgr. Fillion, Bishop of that diocese: "By this time my troops are at Laval". On the same evening, the Prussian troops in sight of Laval stopped at half-past five o'clock, about the time when the Apparition first appeared above Pont-Main, a few miles off. General Schmidt is reported to have said on the morning of the 18th: "We cannot go farther. 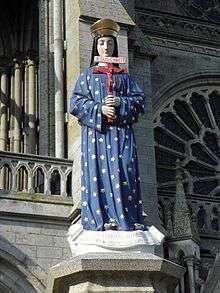 Yonder, in the direction of Brittany, there is an invisible 'Madonna' barring the way." After that the devotion to the Blessed Virgin under the title of that of Notre Dame d' Esperance de Pont-Main, Our Lady of Hope of Pont-Main, was authorized by the ecclesiastical authorities, and the confraternity of that name has been extended all over the world. After the apparition of Our Lady of Hope on January 17, 1871, pilgrims made up of both the clergy and the laity came to Pont-Main. At the same time, inquiries and investigations were made about the apparition; the visionary children were submitted to various intense interrogations. Finally, on the Feast of the Purification, February 2, 1872, Msgr. Wicart, Bishop of Laval, issued a pastoral letter giving a canonical judgment on the apparition. Thus, the veneration of Our Lady of Hope of Pont-Main was given official Church recognition and approval.